In general, over and over, to the trading masses, the markets only make sense after the fact…Tons of logic always surfaces after any big shift in values in an “I-knew-this-was-coming sort of vein”, when the truth is, the overwhelming majority of analysts and traders are perpetually wrong and/or totally surprised by price changes in the markets. I do not make this as someone who views himself as a market guru, but merely as a broker who has been on the frontline in the futures markets for 32 years. Year after year, major popular themes are proven to be absolutely backwards by the markets…and being on the opposite side of those opinions is where I believe the biggest market opportunities often occur. What follows are brief outlines of my opinions and possible strategies in four trades, which I believe, at some point in 2013, will dynamically fit in that category of, “Why didn’t I see it coming?”. 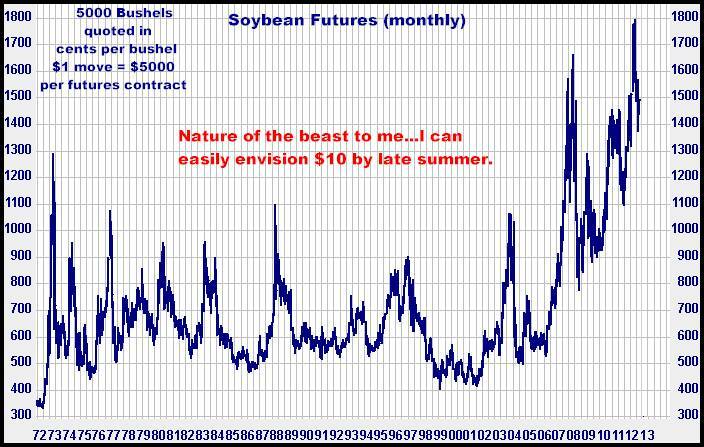 Be Short Corn, Wheat and Soybeans…NOT Long. I assure you, I can articulate, at length, the fundamental argument for either side of any market we trade…but I firmly believe price discovery is more a function of mob psychology than anything else, that what is important today…is not important tomorrow, that all known fundamentals do become incorporated into prices, that all the possible buying (or selling) does get done when the “story” has been repeated ad infinitum in the media, that there is no specific formula with which anyone can quantify where a market should be…and finally, that the markets do inevitably reach a, “Whoops! Everybody’s on one side” point, and go flying off in the “wrong” direction. So, to clarify, even though I assure you I can talk “fundamentals”, you won’t find much of it here. According to the vast majority of industry research, the fundamentals are nothing but bullish for Corn, Wheat and Soybeans. Stocks are tight, too much demand (China, China, China), South American weather, the Drought here, etc. 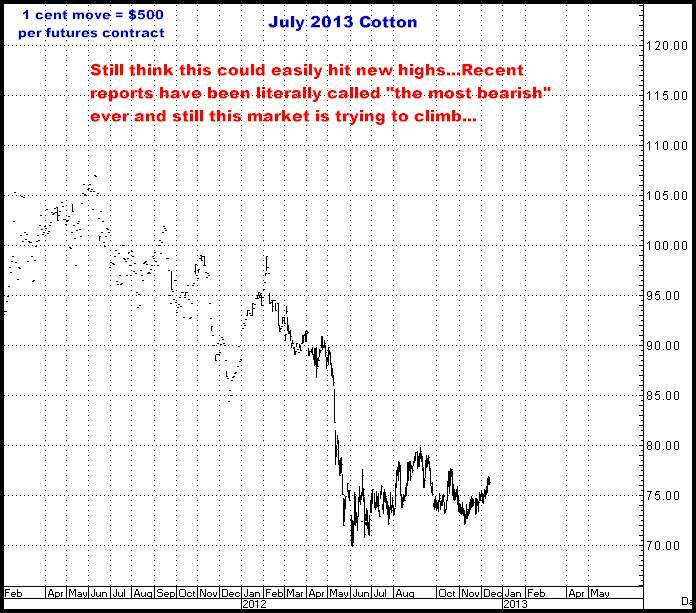 Basic commodity bull market substantiation can be found all over the media. But there IS another side to the argument which starts, in my mind, with the following long term charts, and suggests that all three of these commodities are primed for, and probably have already begun, major bear markets. 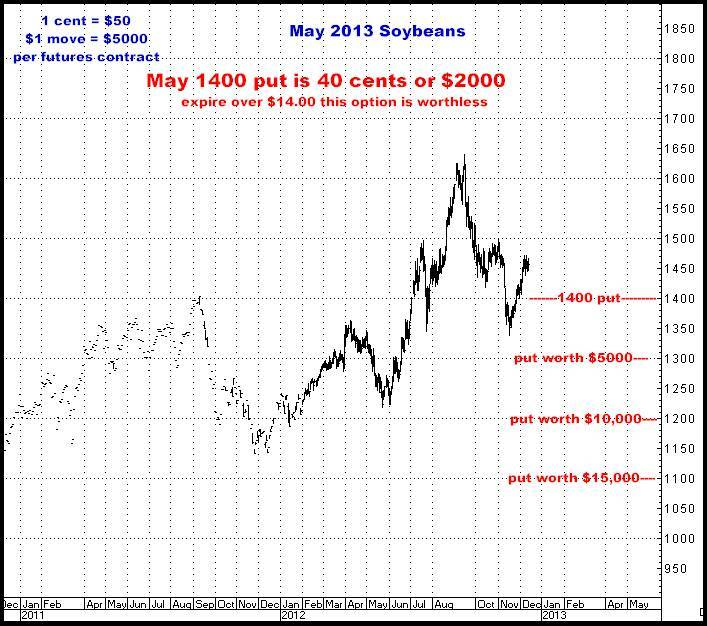 My recommendation continues to be: Get short Corn, Wheat and Soybeans…and STAY short using long options strategies (buying puts), initially in the May or July, 2013 contracts…My very firm belief is all three WILL crack in the same way they have done so repeatedly in the past (see charts following)…I’ve heard plenty of “it’s different this time”, and in my experience, it never really is…and when they do go down, with the leverage available in futures options, the profit potential is quite large. It goes without saying, if I am wrong, there is an equally large potential for losses. Yes, these markets can go higher, or just stay up, but their nature (as observed on the charts) is not to go sideways, and quite simply stated, I like the odds and considerable leverage on the downside. To succeed, I see this as a matter of placing the bet, and keeping the bet on the table…however long it takes. These markets do go up AND down, and from here, at these record prices levels, I believe that maintaining a short position, sooner or later, will pay off in a big way…even if you have to make the trade 2 or 3 times (or more). Obviously, I don’t expect this to happen. I think the trade should be entered now, or I wouldn’t be in it…but when presenting my opinions, I have an obligation to be clear that ANYTHING can happen in these markets and just because I think these markets have nowhere to go but down, does not mean I will be right…And when I am not right, you will probably find yourself losing money. In my opinion, this is where the real “Cliff” is…and $900-$1000 (or worse) Gold would not surprise me at all. This is certainly not everybody on the planet, but when you note the big names on this list, and their bullish unanimity, you do have to ask: Who could possibly be left to join this bandwagon? What NEW buying could possibly be out there to push this market higher again? And my answer is NOBODY. In my mind, all you really have left is, you know who…the PUBLIC…the fodder for all those houses listed above. If Gold does fall out of bed, do you think ANY of these institutions will truly suffer from their opinions? Sure, there might be this or that “rogue trader” who gets his company in a pickle, but generally, the biggest losers will be individual investors…the guys who are forever on the short end of the stick, the guys who are influenced to make investing decisions based on the supposed market “knowledge” of ALL those supposedly smart guys at those well known banks and brokerage houses, who are “logically”, confidently telling them, “You gotta own some of this!”…And you KNOW how this story always seems to end. The Game hasn’t changed. Even though Gold made its high over a year ago, Gold ETF’s are now being owned in record numbers by the public…and wrong though I may be…If ALL the Banks and Brokerage Houses, and ALL the public buyers of those “easy to get in on this” ETF’s are right, and they ALL make money, I will be dumbfounded. I firmly believe, ANY given day from here is where Gold begins one of its classic facerips….and faster than all this hoard of nouveau commodity traders could ever imagine, it will have blown through every “support” level any analyst wants to signify as “significant” on the chart. I mean really…Forget all the “fundamental” reasons to own Gold. Look at the 35 year chart below…Does buying this here, especially when every “suit” on the planet is telling you to do so, really look like a smart idea? There are 3 traditional reasons to ever own this metal: Inflation fears, Geopolitical Fears and the Failure of the World Economic System and its currencies as a monetary vehicle…and I think none of them are valid. Inflation? I’ve heard that argument for 30 years…every time the Fed has been in an easing mode. They used to make a big hoorah about how expanding “Money Supply” was certainly going to lead to hyper inflation…which we never even came close to. Now it’s the QE programs, that according to all sorts of sophisticated logic (again) can only be inflationary. I’m not naïve, and I am being simplistic about this, and recognize the numbers are bigger this time around (but they ALWAYS are---just like you can’t buy a soft drink for a nickel anymore), but it’s all still just Central Bank Easing…providing grease to the system in the form of cheap money and liquidity…and WON’T lead to hyperinflation. Again, I have heard this “Hyper-Inflation is just around the corner!” story forever…and even though there have been a few blips along the way, the big bad wolf has never really appeared. Nice economic theory but just textbook stuff, something else for everybody to chatter about. 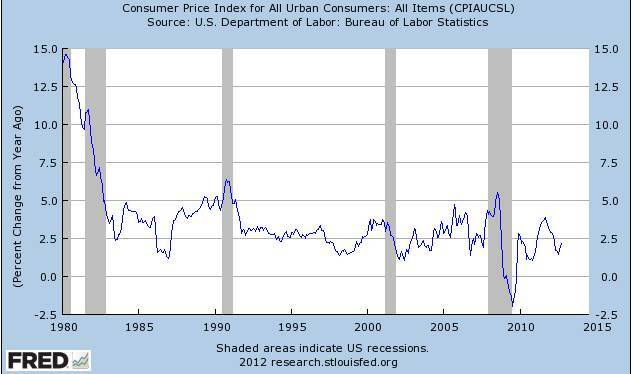 On this next chart, check out the LACK of inflation in the CPI for the past 30 years, and maybe you don’t remember it but I do…I can’t count the occasions when almost every analyst in the world was warning about Fed easing leading to inflation…And it just hasn’t happened…And won’t. Geopolitical Fears? 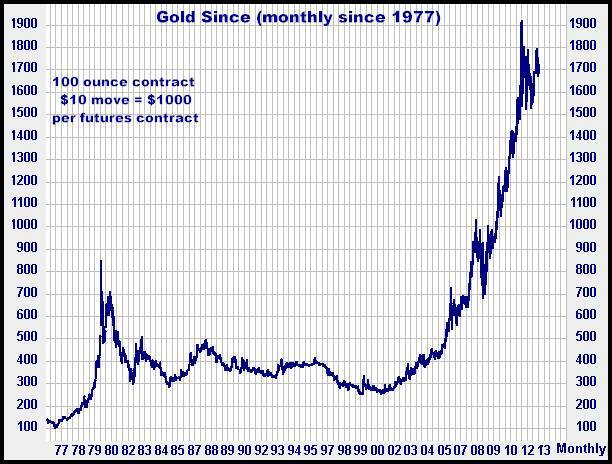 Look back up at that long term chart…Gold went down from 1980 until 2000 and there were any number of geopolitical “crises” during those two decades, none of which produced a lasting bullish effect on the market. It was sideways to lower for TWENTY years. To me, this says the whole “bullish geopolitical” argument is either a myth, or at best, its effect is merely temporary. The System Collapsing and Gold becoming the New Currency? One, the system is NOT going under and any discussion along these lines is ludicrous…And as for gold being the New Currency, I am sure this may sound positively heretical to anyone who truly “believes” in gold, but in this day of instantaneous electronic billion dollar transfers, I think the idea of gold as some great measure of wealth is nothing more than an antiquated perception that is some day doomed to extinction. Yes, it’s a “rare” metal (not as abundant as coal, for example), and yes, it makes for beautiful, everlasting jewelry and trinkets, and yes, it is perceived as a repository of value…but to suppose it is going to become the currency of the world is, I believe, an absurd notion…I see Gold as still just another commodity on the planet. We aren’t going to be lugging it around. And we aren’t going to be swiping debit cards based on any of us having “x” ounces of gold stashed away in some bank. It will always be worth more than many other commodities, but it WILL always do what they all do…GO UP and GO DOWN. Be HOT and be “NOT”. I don’t care what commodity you are talking about. 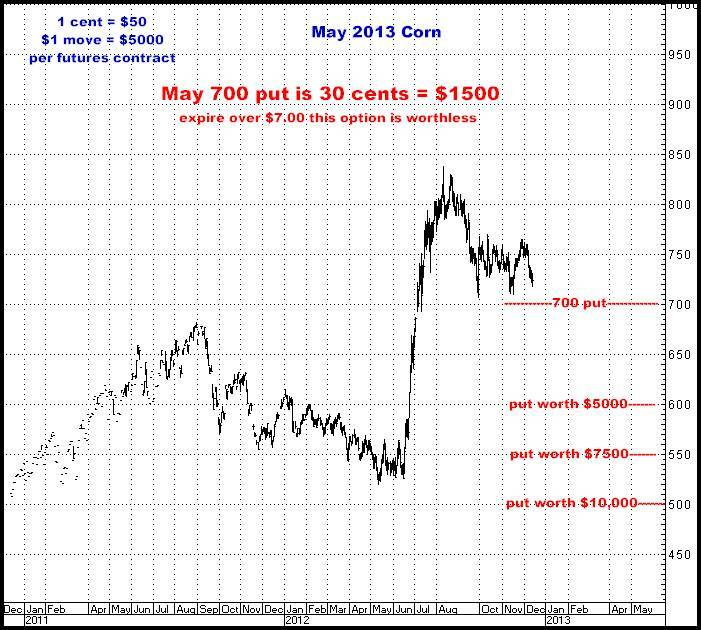 Futures contracts almost ROUTINELY go through 30-50% contractions. 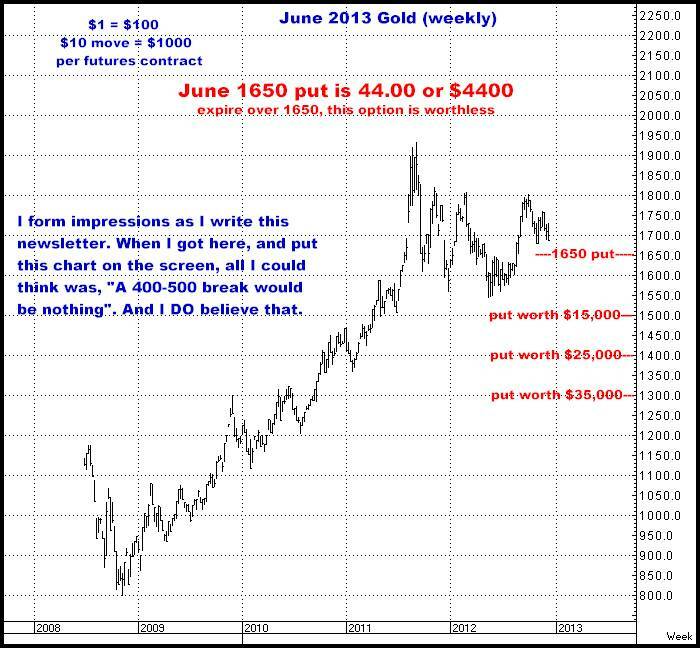 However much “logic” you want to throw at me as to why “Gold can’t go down”, I will insist you are wrong…and I will also insist there is a strong possibility it could lose easily lose 30-40% of its value before we even halfway through 2013. Maybe I’m wrong…but I have seen far too many supposedly bulletproof markets suddenly turn into Bonnie and Clyde’s car when their jig was finally up. Gold CAN go down…and it can go down a lot…and for many years to come.. I do think Gold today is very much like the NASDAQ of 2000…that this story is old, old, old news. I hear talk of support at $1600, $1500, or whatever number any analysts want to pick, and having probably done more technical analysis than 99.9 % of the traders on this planet, I will tell you that any talk of this or that level being significant is a bunch of bunk. I have seen hundreds of markets, that, when the mob psychology switch gets thrown, just go straight and relentlessly down…And with long gold being one of the most popularly widespread ideas I have ever seen, maybe I’m wrong but a relatively quick trip to under $1000 would not surprise me in the least. How quickly? Who knows? Maybe a year. Maybe three? But I think anyone who buys this commodity, and can only get a return on their investment if it goes up….and then they sell it, if they take the money….is going to end up living with a losing trade until the finally take their loss somewhere further down the “yellow brick road”. 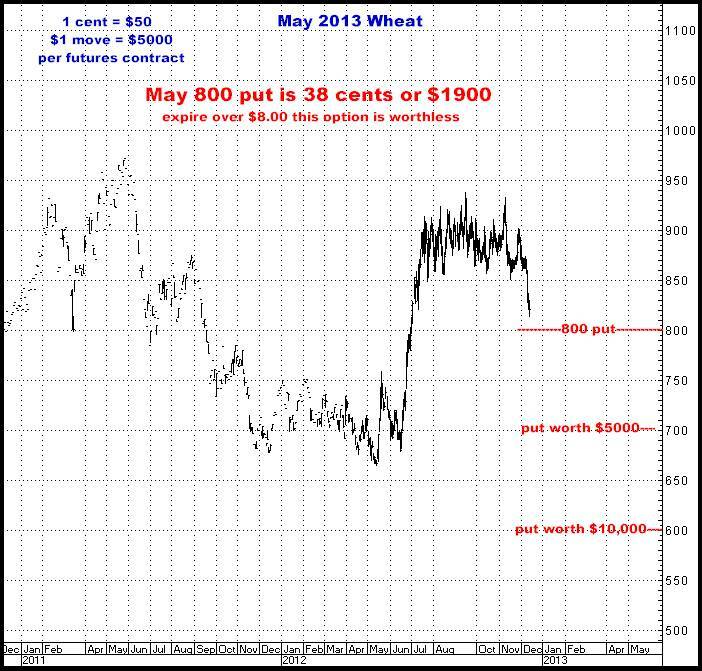 SAME AS CORN, WHEAT AND SOYBEANS, I RECOMMEND GETTING SHORT GOLD THROUGH THE PURCHASE OF PUTS…AND STAYING SHORT. I REPEAT: I THINK OWNING GOLD IS THE MOST POPULAR TRADE I HAVE EVER SEEN IN THIS BUSINESS. AND POPULAR IDEAS CAN BE LIKE POISON IN THIS BUSINESS. With all of these recommended options, I urge you to go back to the long term charts and decide for yourself if my potential targets look unreasonable. Maybe I am dead wrong, but I think these are all giant trades…especially the Gold, though it’s not cheap. 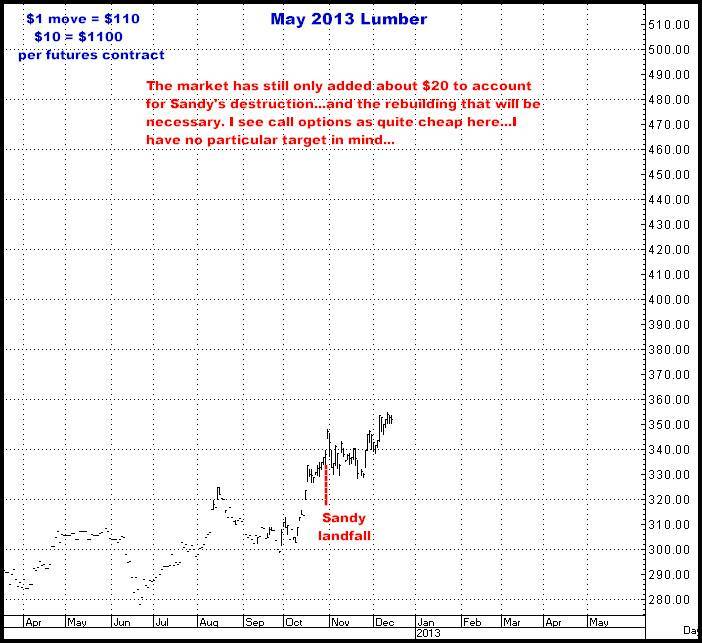 And I am still long and buying Cotton and Lumber, both of which made new highs for their moves this week. I will cover them more extensively in another letter. Thanks if you read this all the way through…And please pass this along to anyone who might be interested in trading my ideas. Pick up the phone and call me. In a nutshell, the grains sure look like they have rolled over…and Gold sure looks ready to crack wide open. FUTURES TRADING IS NOT FOR EVERYONE. THE RISK OF LOSS IN TRADING CAN BE SUBSTANTIAL. THEREFORE, CAREFULLY CONSIDER WHETHER SUCH TRADING IS SUITABLE FOR YOU IN LIGHT OF YOUR FINANCIAL CONDITION. PAST PERFORMANCE IS NOT INDICATIVE OF FUTURE RESULTS. THERE IS NO GUARANTEE YOUR TRADING EXPERIENCE WILL BE SIMILAR TO PAST PERFORMANCE.